Happy Tea for Tuesday to you! It's a Shell Sherree bonus! I'd forgotten there was anything to that song. I liked all three renditions, but the Muppets take the sugar cake. The Muppets are in a class of their own, Petrea. You have so many loyal fans, Shell, that tea for two will surely not suffice. There will be unseemly squabbling, possibly leading to breakages. I'd hate to see those lovely wings chipped. and it's only 10pm..tut tut...silly me. Such a tasty Tuesday treat! Delightful drawing. 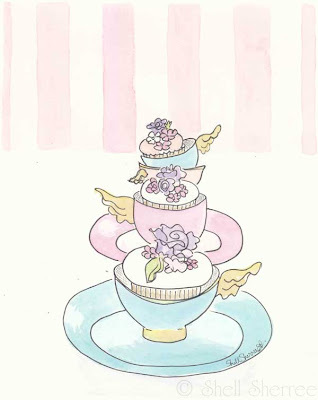 I'll try to just eat one cupcake, but I know I'll have many cups of tea. As much as I like the goofy rendition by the Muppets, and the classic Ella, I'll vote for the mellow Doris Day version of Tea for Two. It is true what they say: every time a bell rings a teacup gets its wings! 'Tis the season for tea and cupcakes. And a bonus Shell Sherree! YAY! dkshopgirl ~ at 10pm, anything can happen! Hiker ~ Ella told me you'd say that. Ms M ~ mercurial teacups? I like it! Cali ~ hee! Sounds good to me! Yep, better make it tea for twenty, at least, in these elegant cups. And ginger is my favorite (how'd you know?). As for the musical selection, Ella trumps Doris, but the Muppets' version beats out even Ella. Good to see you here so soon! I do love the Muppets version! 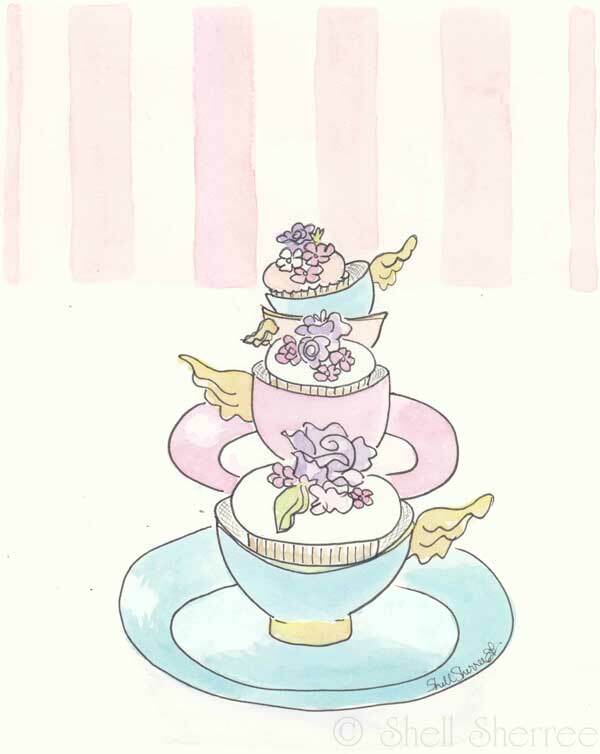 So nice to see you here again, and I think that you could easily design fancy teacups for a living! Adorable! You're so kind, dear Genie ~ that's a lovely idea! I love ginger tea, especially while listening to the Muppets and sipping from cups with wings. You're such a generous soul; I'm sure you'll pardon my tardiness. Much very you thank, Shell! Oh, Susan ~ laugh me made you, much very!! You're never tardy here.